Then, two developments forced him to think in a larger context: President Donald Trump visited Paradise and advised Californians to rake their forest floors, and Sen. Bernie Sanders announced a national town hall on climate change. The Washington, D.C., town hall would feature well-known experts and activists – climate change stars, so to speak. And that was when Mullick had a uniquely Mullick thought: What if the town hall also included Camp Fire survivors from Paradise who could tell powerful stories of escape and loss? After all, experts have been clear that while climate change didn’t cause the Camp Fire, it played a big role in its explosive character. That idea soon blossomed into something larger, as often happens with Mullick’s projects. 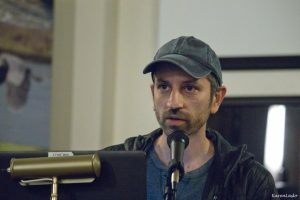 These days, while Mullick is focused on a short-term goal — to provide a video platform for stories from the Camp Fire and produce a film about the fire and climate change – he’s also thinking long term. Mullick, as co-founder, now plans to build a global movement, #ClimateUprising, that will help people around the world who have been affected by climate disruptions tell their stories and become part of a bipartisan call for action. Four people who survived the Camp Fire, plus three local community leaders, including Democratic congressional candidate Audrey Denney, traveled to the Dec. 3 town hall. They participated in 17 meetings in Washington, D.C. in two days with influential figures, including Sanders and Congresswoman Nancy Pelosi. By the time they had returned, the group had a project outline. Paradise residents are in the unfortunate position of being able to share stories that can encourage understanding of the effects of climate change on individual lives. Now, photos and video of Camp Fire survivors, often holding cardboard signs that say “#ClimateUprising” and standing in the ashes of decimated Paradise homes, are popping up on social media. Nirvan Mullick speaks at a Gateway Science Museum forum. 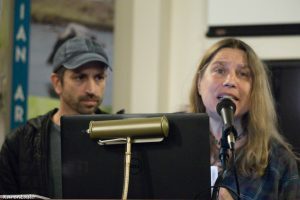 In fact, acreage burned by wildfires nationwide has almost doubled in the past 30 years as the dry season becomes longer and hotter, and fires become more explosive and difficult to extinguish, according to Citizens’ Climate Lobby, which hosted a forum earlier this month at Chico’s Gateway Science Museum. The next step for #ClimateUprising is a Sunday photo shoot designed to produce what Mullick calls an “iconic image” – one likely to spread rapidly on social media — that suggests the impact of a fire that displaced more than 50,000 people. At 1 p.m. Feb. 17, #ClimateUprising plans to shoot a “group portrait” in Paradise featuring up to 1,000 people, including Camp Fire survivors and area residents who support action on climate change. A professional film crew will work under Mullick’s direction, using a 30-foot Jib Crane, to photograph the crowd holding up a giant #ClimateUprising banner. Beyond that, a Chico State student member of the newly-formed Chico chapter of #ClimateUprising is planning a student strike. The chapter is helping to plan a town hall this spring, the “CampFire Town Hall on the Climate Crisis.” Mullick will use the group portrait to promote the town hall. 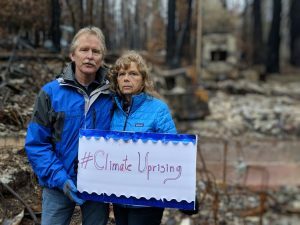 Susan Dobra, who lost her home in Paradise, is a leader in the local Climate Uprising chapter. But Mullick argues that even though climate change has been turned into a hot-button political issue by the conservative establishment, it deserves and requires bipartisan thinking. Mullick, 43, is soft-spoken and thoughtful, a man who was born in India and raised in Florida. (His first name is pronounced like “nirvana” without the “a.”) He has an MFA in experimental animation from the California Institute of the Arts. He’s long been interested in social-impact filmmaking; he’s demonstrated a talent for envisioning imagery that conveys a relatable message. In his 11-minute film, “Caine’s Arcade,” the filmmaker used social media to organize a “surprise flash mob” — a crowd of customers for a cardboard arcade that had been constructed by a boy in east Los Angeles. If you missed this film short when it was viral, scroll down this page to watch it. Mullick also directed the #EarthtoParis video campaign for the United Nations Foundation urging world leaders to act on climate change. He believes it’s the most urgent matter on the table. “I’d like to have a family one day,” Mullick says, “and I’m concerned about what kind of a world we would be leaving them with. Mullick plans to follow the town of Paradise, and the region, for that matter, right up to the 2020 election to see whether a District 1 congressional representative is elected who will act on climate change. The Camp Fire that devastated Paradise struck two days after the Nov. 6 re-election of Congressman Doug LaMalfa, who hasn’t acknowledged human activity as a driver of climate change and has been labeled by the climate movement as a climate change denier. In the 2018 General Election, LaMalfa won over Denney in Paradise by almost 4 percentage points. So will the Camp Fire – which moved with extraordinary speed because of changing climatic conditions – shift views? “I’m focused on rebuilding and helping the people of my town,” Jones told ChicoSol. Mullick believes opinions are shifting as people sense that the Camp Fire was an extraordinary event. He tells the story of meeting a Republican veteran in a local hardware store who had supported LaMalfa and lost his home in the Camp Fire. He and his wife have joined Climate Uprising. “We can’t be afraid to have these conversations. It’s really important we find a way to talk to each other about this,” he says, noting that he tries to be “delicate” because of what Camp Fire survivors have been through. Chico State geography professor Mark Stemen says he was immediately drawn to the Climate Uprising tag line, “We must rise before the sea” and reached out to Mullick. Stemen, who heads the city’s Sustainability Task Force, says he’s seeing new faces at local meetings on climate change because of the Camp Fire’s impact and Mullick’s work. Stemen says the #ClimateUprising Facebook page now serves as an “umbrella alliance” for local groups that were already working on related issues. 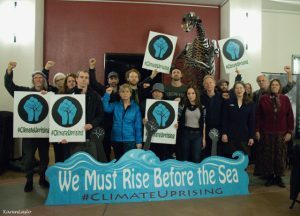 Members of Chico’s Citizens’ Climate Lobby join Climate Uprising for a group photo after a Gateway Museum forum. Stemen also believes Mullick’s work will help keep national attention on the Camp Fire disaster and the need for resources to help the town recover. Leslie Layton is editor of ChicoSol. Thanks, Leslie, for the great article. I’m hoping we can use this moment of attention we’re getting for the Camp Fire to help sound the alarm that climate change–or what many are now calling climate collapse–is not some future problem for the next generation but something that is now upon us and that helped burn down our town. People tend to think about the polar ice caps and rising waters when they think about climate change. And those are very real problems. But for us, here in California, climate change means flooding/mudslides in the winter and fire in the spring, summer and fall–this year, next year, and for the foreseeable future unless we turn this thing around. The science connecting these events to climate change is nonpartisan. If you want to add your voice to the call for bipartisan climate action, please join us at #ClimateUprising–Facebook (https://www.facebook.com/ClimateUprising/) and Twitter or at http://www.ClimateUprising.org. And check out the video of my partner John-Michael Sun singing in the ashes of our home about what it feels like to be a climate refugee: https://www.facebook.com/ClimateUprising/videos/2696378967070123/ The pictures tell the story.